- At 6am this morning the artillery bombardment of the Russian line between Tarnow and Gorlice intensifies, with 370 light and 144 medium and heavy artillery batteries raining fire on the enemy. At 9am they are joined by almost a hundred trench mortars, their plunging fire ideal for landing shells in trenches and penetrating bunkers for maximum damage. 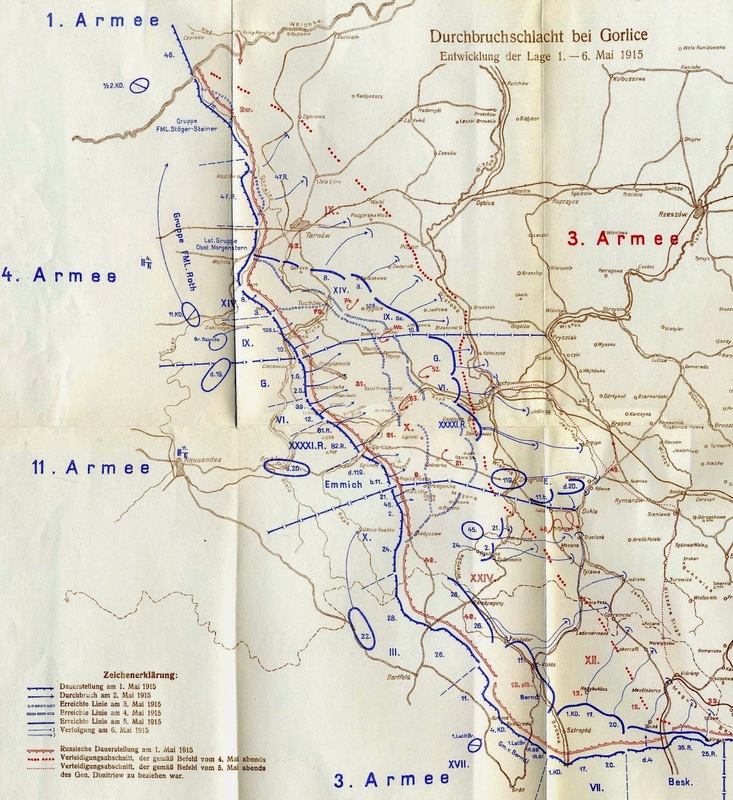 Finally, at 10am infantry from ten divisions of the German 11th Army, as well as eight divisions of the Austro-Hungarian 4th Army to the north, begin their advance. The Russian line they assault, despite ample warning, is almost comically unprepared to defend itself. As General Ivanov of South-West Front has decreed an imminent revival of the Carpathian offensive, the focus of Russian commanders in the region is to the south, not the west from which the Germans are attacking. Indeed, to help facilitate the Carpathian offensive 3rd Army has taken over responsibility for the western end of the Russian line in the mountains, and the attention of its commander is firmly fixed there. Thus 3rd Army has assigned only two corps - IX and X - to defend the western face of the Russian line while the rest of the army is deployed south and east of the Wistoka River. Most of the army's reserves are also to the south and are poorly-positioned to respond to an attack from the west. The line held by IX and X Corps has also been quiet since the end of December, and thus there is little expectation that any significant fighting might occur here. As such, the Russian trenches are extremely primitive, even by the standards of the Eastern Front - perhaps one or two thin strands of barbed wire in front of one thin trench that is little more than a ditch. No provision had been made for reserve positions - indeed, when the commander of X Corps requested permission to build a reserve position, he was told that if he has the manpower to spare for trench-digging he must have more manpower than he needs, and one regiment was withdrawn from each of X Corps' divisions. Most of the formations in these two corps were also second-rate, with infantry often armed with antiquated rifles they did not know how to use. Russian tactics were also disastrous - in both corps their available infantry were concentrated in the front-line, making the men vulnerable to bombardment as well as leaving few reserves in case of emergencies. All told, for all the skill the Germans show and will show in preparing and executing offensive operations at Gorlice-Tarnow, it was also the case that the region was perhaps the most vulnerable to precisely the sort of overwhelming attack that descends on them this morning. The preliminary bombardment largely obliterates the primitive Russian defences and a third of the Russian defenders are killed by artillery fire in the hours before the attack. Most of the rest are reduced to a state of shock, such that the attacking German infantry encounter only sporadic resistance - one German corps manages to take four thousand prisoners in the first hour of combat. When the Russian survivors attempt to retreat, they have to escape over open ground, where they are vulnerable to further artillery bombardment. Further, because there are no reserve defensive positions, once pushed into the open the Russians are unable to halt the momentum of the retreat and rally in new trenches. By late afternoon the ruins of the town of Gorlice are in German hands and a gap has opened between the retreating remnants of IX and X Corps while the German 11th and Austro-Hungarian 4th Armies continue to surge forward. The Russian response, delayed by the temporary absence of 3rd Army commander, is sluggish, and the only substantial measure is convincing General Ivanov to release III Caucasian Corps to 3rd Army. The advance elements of the corps, however, are only as far west as Jaslo this evening, which is still twenty kilometres behind the front - though granted, the front line is rapidly moving in their direction. The German offensive at Gorlice-Tarnow, May 2nd to 6th, 1915. - This evening the Ottomans attempt another attack on the British and French lines on Cape Helles. This time the Entente are waiting for them, and when the Ottomans move into the open to attack they are cut down by rapid fire from French 75mm guns. Meanwhile, the heavy resistance at Cape Helles, combined with a slackening of Ottoman artillery fire, convinces the commander of ANZAC forces to the north that the Ottomans have thinned their lines to hold the British and French before Krithia. To take advantage of this perceived weakness a night attack is ordered. An artillery bombardment commences at 7pm, and shortly thereafter Australian and New Zealand battalions are ordered to advance, hoping to secure the high ground beyond Monash Gully relieve the Ottoman pressure on the Nek. However, the attack miscarries almost immediately - some of the battalions are not in position to attack when the advance begins, and the Ottomans have effectively entrenched to take advantage of the rough terrain. - At 8am Emden's landing party departs El Wegh on the Red Sea, travelling inland towards the village of El Ula on the Hedjaz railway. As they leave the coast and enter mountains, they are escorded by Suleiman, Sheikh of El Wegh.